On Sunday afternoon, North Carolina’s starting point guard, Kendall Marshall, suffered a fractured wrist during the Tar Heels’ 87-73 win over Creighton. The Tar Heels advanced to the Sweet 16 and will play Ohio University on Friday, but even after a successful surgery on Monday, it is questionable whether Marshall will play. 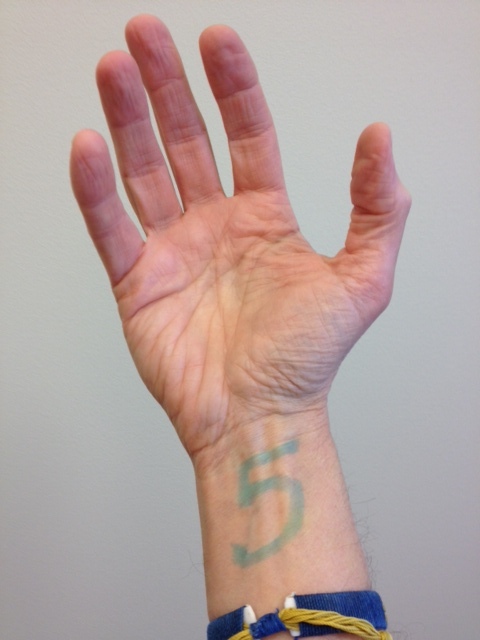 An anonymous student started a Twitter account on Monday to support Marshall, called @PassFir5t, and asked fans to write a “5” on their right wrists, and send photos in support of Marshall and his recovery. So from my wrist to yours, Kendall, here’s to a speedy recovery and good luck to the Tar Heels this weekend. This entry was posted in Miscellaneous on March 22, 2012 by roperhealth.